Poor diets in low income countries are still hindering progress to reach the second sustainable development goal; to end hunger, ensure food security and improve nutrition. However, donors and the private sector have a unique opportunity to help – but only if they embrace the crucial issue of diversifying food production and consumption. Early December in Brussels EU officials, member states, and civil society representatives met to discuss the current impact and future focus of EU investments on food and nutrition, at the meeting organised by Generation Nutrition, Alliance 2015 and MEP Linda McAvan. The SD4All programme, through Hivos’ membership of the Alliance2015, also contributed to the discussions. The key message addressed to the European Commission was that in order to advance food and nutrition security outcomes, private sector actors, in particular small and medium sized enterprise (SME’s) must be encouraged and supported to diversify diets from farm to plate. The impacts of poor diets in many low income countries can be complex. They can include obesity on one hand and poor nutrition - micronutrient deficiencies - and life threatening hunger on the other. Most cases of poor nutrition and hunger are caused by insufficient access to or affordability of a variety of healthy foods. Poor diets arise when families struggle to grow a diverse range of crops on their farms, or are unable to buy a variety of nutritious foods at local markets. Joint action to tackle these issues to diversify diets within local food systems is central to achieving positive change. Alongside improved diets, diversifying smallholders’ agricultural products holds the potential for increasing biodiversity and tackling climate change. From a food systems’ perspective, it makes sense to invest in diversified agricultural production systems, which – next to providing a more diverse range of nutritious crops - can regenerate degraded soils, restore landscapes, and help farmers adapt to climate change. Donors should take this win-win approach into account and apply an integrated or systems lens when creating strategies to improve diets. There is a key role for donor and domestic governments to work with the private sector, particularly small and medium sized enterprises (SME), to stimulate the creation of diverse markets for nutritious foods in countries facing high rates of hunger and poor nutrition. “90% of the Zambian agricultural budget is allocated to the production of maize which obstructs the development of markets for more nutritious crops like sorghum, millet and cassava – donors and governments can provide SME’s with incentives to address this”. Donors can facilitate SME access to capital and offer attractive lending conditions through development banks and the creation of investment facilities. As a result SME’s have the potential to access finance in order to start diversifying production and provision of food. This would be an important step forward. Additional measures can be taken by domestic governments to stimulate private sector engagement in diversifying national and local food systems. Domestic fiscal policy reforms can be considered to encourage the production of more nutritious foods, for example by providing tax benefits for the production of vegetables. Incentives to enhance communications about healthy dietary choices should also be explored. Zulu: “Open discussions between donor and domestic governments on how to best develop such reforms is an important way to make a shift towards responsible food investments”. Through its External Investment Plan, the EU is planning to allocate official development assistance (ODA) to increase private sector investments in development. The Dutch government has already experimented with allocating ODA funds to public private partnerships, and is currently inviting interested parties to submit applications for its new SDG2 partnership facility. This ‘blended’ aid money is an interesting new tool that could contribute to the development of markets and an active SME private sector in developing countries. International companies can also stimulate (local) market demand for more nutritious food. However, it is crucial that these actors strictly adhere to existing national and international standards and regulatory frameworks to ensure a positive food and nutrition impact. International labour laws, environmental regulation, and other internationally agreed guidelines like the Principles for Responsible Investments in Agriculture and Food Systems should be respected to ensure international private investments concretely benefit local populations, especially vulnerable groups. A concrete recommendation to the EU is to support the development of safeguards that ensure Public Private Partnerships (PPPs) prioritize inclusion, effectively eradicate poverty and improve the nutrition status of the most vulnerable populations. Both EU officials and civil society organisations are keen to see the private sector and SME’s in particular take a more active role in diversifying diets and local food systems in low income countries. While there is plenty of political will on the table, it is recommended for the EU to propose a concrete pathway in its new Multiannual Financial Framework (MFF) and External Action Plan (EIP) to incentivise private sector actors to successfully diversify their production and ultimately diversify diets. The New Year ahead provides an opportunity for donors and domestic governments to systematically discuss the role of private sector in tackling hunger and poor nutrition. Effectively addressing food and nutrition security through diversifying production and consumption will improve diets and biodiversity. But private sector actors must understand and embrace the diversification agenda if the global community is to take the opportunity for real reform forward. 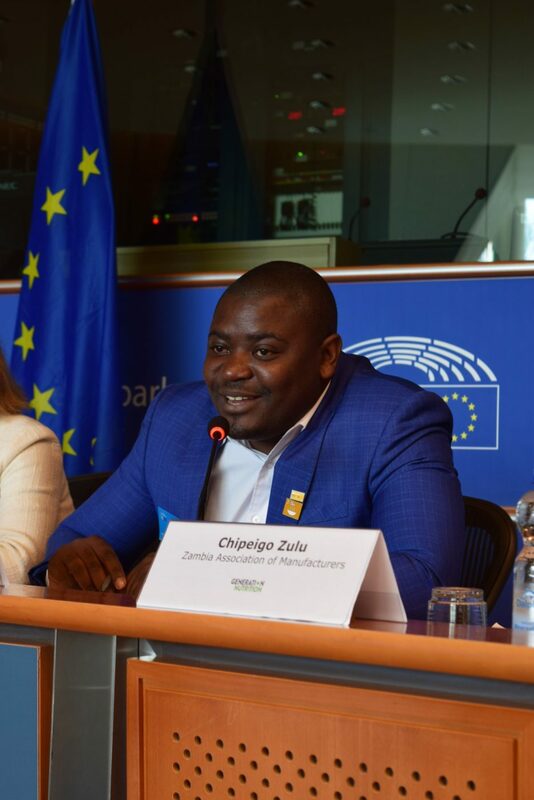 With thanks to Mathews Mhuru (Director of CSOSUN Zambia), Chipego Zulu (CEO of the Zambia Association of Manufacturers), who also contributed to this blog.